...... in accordance with the date, time and place of birth (provided by you) in conformity with Vedic Astrology +your anticipated date of marriage worked out on the basis of SPS system and astro-numerology. Our considered opinion on the results obtained by following the above stated approach. Mathematical basis why Jupiter is considered to be the planet associated with the occurrence of one's marriage. Your date of marriage vis-vis other planets. Provision to study Horoscope Varga Kundli and Dasha-Antardasha charts. Provision for the study of the Gochar of the likely date of marriage. Provision for the study and analysis of the likely date of marriage on the basis of K.P.System. Qweas is providing links to Vivaha Sutram 2 2.0 as a courtesy, and makes no representations regarding Vivaha Sutram 2 or any other applications or any information related thereto. Any questions, complaints or claims regarding this application Vivaha Sutram 2 2.0 must be directed to the appropriate software vendor. 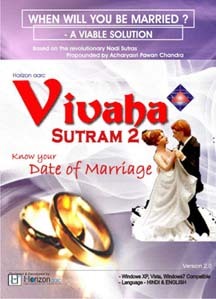 You may click the publisher link of Vivaha Sutram 2 on the top of this page to get more details about the vendor.